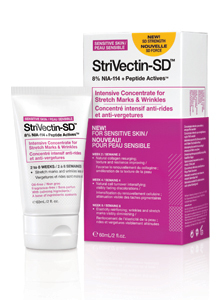 Strvectin is to launch its new StriVectin-SD™ Sensitive Skin Intensive Concentrate for Stretch Marks & Wrinkles that has been tested on sensitive skin to reduce the appearance of facial wrinkles. StriVectin-SD™ Sensitive Skin is packed with collagen building, wrinkle reducing, anti-ageing ingredients but without fragrances, oils or other irritants that can harm sensitive skin. StriVectin-SD™ Sensitive Skin diminishes wrinkles, even and smooth skin’s tone and texture, and boost the skin’s protective barrier so it actually becomes less sensitive over time. The new anti-ageing serum will be available from January 2011 at Space.NK, Harvey Nichols, Harrods & Selfridges priced at £115.00 for 150ml and £67.00 for 60ml. After 30 global patents, 25 years of scientific study including DNA skin cancer prevention, and numerous clinical trials.